Consisting of two components, the Maratek COMBO-II units, offer an automatic paint gun washing station - Maratek model GW-173– and a solvent recycling unit – either an RS-3A for the COMBO-3-II or an RS-6A for the COMBO-6-II. 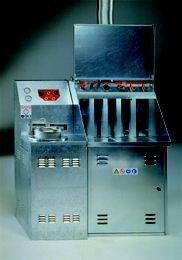 These units provide the benefit of recycling your solvent waste stream in an integrated tools, spray gun and parts washer. 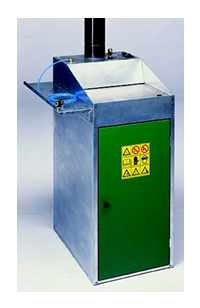 The GW-173 paint gun washing station is ideal for automatically cleaning all types of spray guns, tools or small parts and features an automatic washing chamber which performs a thorough cleaning of all types of spray guns. Other features include the integration of self-balancing solvent holding tanks, an exhaust duct system to capture any fugitive solvent emissions, a spray gun testing port, as well as taps for light manual cleaning and access to clean solvent. Many specific options are available on the COMBO-II models. Units are tailored to meet your requirements and integrate as seamlessly as possible into your production process. Contact Maratek to discuss your specific needs or to obtain more details on equipment specifications.